It was fifty years ago today- Friday January 3, 1969 actor Howard McNear better known as Floyd Lawson- Floyd The Barber from The Andy Griffith Show died from complications from pneumonia following a stroke. McNear was sixty-three years old. McNear wasn’t the first Floyd The Barber- on The Andy Griffith Show- actor Walter Baldwin played Floyd for one episode- Season 1 Episode 12. Floyd was somewhat absent minded and an laid back- character and his barber shop seemed to be a meeting point in Mayberry- did he ever really cut hair? Outside of Andy, Opie, Aunt Bee and Barney- the four main characters in the show- only Goober appeared in more episodes than Floyd. McNear took over the role in the second season and would appear in a total of 80 of the 249 episodes in the entire series. 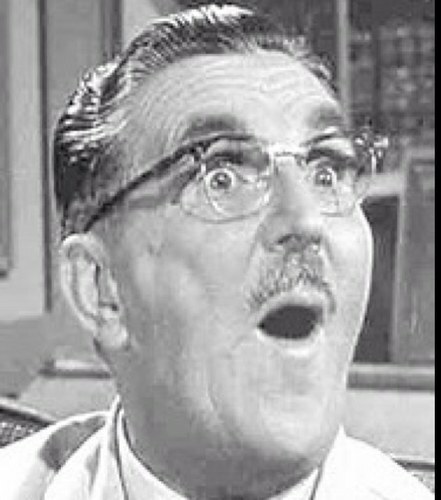 Howard McNear had suffered a serious stroke midway through the third season and missed a year of the show. The producers of the show and Andy wanted him to come back when he was able to- and when he did come back they set him up with a special chair where he sat most of the time. McNear could only stand for short periods of time. His health continued to fail him and his final appearance on the show was in 1967 in the season seven finale. Kurt Cobain was inspired by the Floyd character and Mayberry- to write a song titled “Floyd The Barber” which appears on their Bleach album. “Kurt Cobain was inspired by the Floyd character and Mayberry”. I’m sure I didn’t see That coming. I can’t see the city fathers of Mayberry letting Kurt into town. Now, there’s a mental picture. Kurt living next door to the Taylor’s and hanging out with Opie. Yes! Maybe Andy could have taken him fishing up to Meyers Lake. Barney’s eyes may have finally popped out of his head. I’m catching my breath…I can’t add anything to this conversation. Floyd I mean Howard looked older than 63. I guess the poor health does that.. I never cared for Aunt Bee. … and why did everyone call her Aunt Bee? No… Aunt Bee was a stick in the mud…apparently in real life also! Beatrice Taylor… or another B word at times.